For the third part of this series, I would like to interview the two men who were in charge of the software development of Wii Fit. For starters, could you two introduce yourselves and briefly describe your responsibilities in developing Wii Fit? 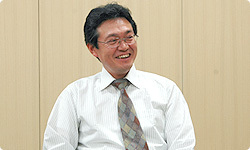 I’m Hiroshi Matsunaga, also from the Entertainment Analysis & Development Division. I was the chief director for Wii Fit. As a designer, my work until now mostly involved creating game art, so Wii Fit marks my first attempt at handling the overall production of a game. Before this project, I was working on the animation and other visual aspects of Mario in Super Mario 64 DS1. 1 A 3D action game released simultaneously with the Nintendo DS in December 2004 in Japan and March 2005 in Europe and on its own in April 2009 in South Africa. I would imagine that the two of you felt a little lost when you first heard about the Wii Fit project. What was your reaction when Miyamoto-san suddenly assigned you to make a game revolving around the concept of weighing yourself every day? With games like Mario Kart, you know right from the beginning that Nintendo is going to invest a lot of time and effort into selling them. When you started working on Wii Fit, did you ever imagine that it would become such a high profile product? Of course not! (laughs) I couldn’t see that happening at all, because I started by thinking about the location where you’d most likely put bathroom scales. Yes, so I started by thinking about the most basic aspect, which was how to bring an accessory similar to bathroom scales into the living room. I thought, maybe users could use a USB storage device2… 2 A portable flash memory device that makes it easy to transport data onto computers and other electronic devices. In the beginning, I was really racking my brains because there were an unbelievable number of limitations involved in integrating the use of an accessory similar to bathroom scales with a game, and I just couldn’t come up with any good ideas. 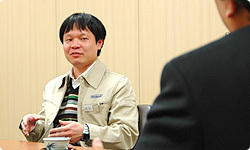 Matsunaga-san, did Miyamoto-san tell you to make software for this at the same time as Sugiyama-san? 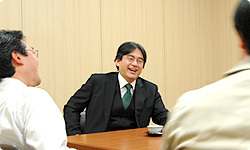 Miyamoto-san had actually given me an assignment based around the concept of health before Sugiyama-san, and I had been experimenting with creating health-related software on the Nintendo DS. In other words, you’d been worrying about the health concept for longer than Sugiyama-san had! (laughs) You must have been feeling relieved that you had just completed Super Mario 64 DS, when you were suddenly told that your next assignment would be related to health. Were you surprised? What concepts caught your attention while reading the books you bought? I thought about focusing the game on the concept of dieting, so I bought a whole number of diet books, only to realise that there were several different types of diets. Some diets focused on exercise, while other diets focused on limiting the food you eat. After considering which diet would be the easiest for most people to begin, I decided to approach the game from a nutritional angle. I thought people might find it useful to be able to record the calories they consumed with every meal into their DS systems. So, for example, if you had some ramen noodles for lunch, you would input this information in your DS system and it would assign a certain number of calories to it. I also wanted to allow users to input their weight, so that they would be able to come to the conclusion by themselves that their weight is affected by what they eat. By making that connection, I hoped that users would then take the next step and start dieting. I have a story related to that. At one point I was measuring my weight every day with Wii Fit while the game was still under development. For a whole week, I saw my weight going down just a little bit every day. But then I ate out on Sunday, and when I measured myself the next morning, I was shocked! (laughs) Just one meal can ruin a whole week’s progress. 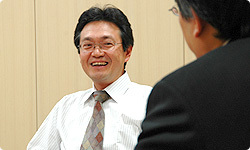 Going back to your program, Matsunaga-san, you thought it would be interesting to give users a way to clearly see for themselves why their weight increases or decreases. Was it at this time that Miyamoto-san told you that he’d been having fun weighing himself everyday? What did Miyamoto-san say about it? Miyamoto-san can be pretty ruthless with projects that don’t work! (laughs) When did the next turning point for this project come? That would be when the bathroom scales concept was introduced. After that, we decided to develop the software for Wii instead of the DS. And that’s how you ended up working with Sugiyama-san. Yes. In the beginning, we were really groping in the dark and, to be honest, I wasn’t sure whether we would be able to create anything decent from that concept. As a start, we purchased a number of different bathroom scales and talked with scales manufacturers. What did you talk about with these manufacturers? It’s very rare for us to discuss a game we’re developing internally with another company, isn’t it? We don’t go around asking people in other companies about how to make Mario more fun, for example! (laughs) You must have felt a bit hesitant when making these trips to the scales companies. Yes, definitely! (laughs) This was completely outside of our specialist field, and we didn’t even have any business experience. As it turns out, even the companies that agreed to meet us didn’t have any idea why we wanted to talk with them. Definitely! (laughs) We tried explaining that we wanted to create something like bathroom scales that could be plugged into a TV, but I don’t think we were able to clearly convey what we wanted. That was their general attitude! (laughs) It turns out that for scales manufacturers, the biggest products are body fat scales. Maybe that’s why they didn’t show any interest in our ideas, even if they did hear us out.